A 50 y o male with ptosis, diplopia, progressive weakness and breathlessness while walking. Has to sit and take rest to walk again, this is how he used to manage for last 1 year. Clinically diagnosed as Myesthenia Grevis. Ach receptor antibody test showing positive results. Non contrast CT screening of mediastinum done to rule out MG shows a well circumscribed lobulated soft tissue density in anterior mediastinium. Characterized by varying degrees of weakness of the skeletal muscles of the body. Muscle weakness increases during periods of activity and improves after rest. Muscles eye and eyelid movement, facial expression, chewing, talking and swallowing often involved. The muscles that control breathing and neck and limb movements may also involved in severe cases. Occurs due to defect in the transmission of nerve impulses to muscles at the NM junction. Normally the nerve endings release a neurotransmitter substance that is acetylcholine at neuromuscular junction binds to acetylcholine receptors generate a muscle contraction. In myasthenia gravis antibodies block, alter, or destroy the receptors for acetylcholine at the neuromuscular junction and prevents the muscle contraction. These antibodies are produced by the body's own immune system. Thus, myasthenia gravis is an autoimmune disease where the immune system which normally protects the body from foreign organisms mistakenly attacks itself. Thymus plays an important role in the development of the immune system in early life. Its produces cells that form a part of the body's normal immune system. The gland is somewhat large in infants, grows gradually until puberty and then gets smaller and is replaced by fat with age. In adults with myasthenia gravis, the thymus gland is abnormal. The relationship between the thymus gland and Myasthenia gravis is not yet fully understood. Scientists believe the thymus gland may give incorrect instructions to developing immune cells, ultimately resulting in autoimmunity and the production of the acetylcholine receptor antibodies, thereby setting the stage for the attack on neuromuscular transmission. Unfortunately, delay in diagnosis is not unusual in cases of myasthenia gravis. Because weakness is a common symptom of many other disorders. Tests are available to confirm the diagnosis are blood test for detection of present acetylcholine receptor antibodies , edrophonium test, Nerve conduction study, EMG, CT thorax etc. Used to identify an abnormal thymus gland or the presence of a thymoma. Its size, shape and the proportion of solid tissue and fat vary with age. 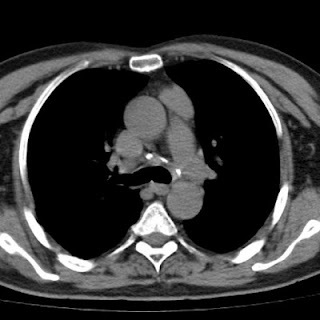 There is no comprehensive work describing the size and morphology of the normal thymus on CT. As a result, many adults with some preserved soft tissue in the thymus may undergo extensive work up to exclude mediastinal tumor. Normal thymus is a triangular density in the anterior mediastinum up to 30 years of age.In young lateral contours are convex laterally and become concave with age. Thymus should be < 1.8 cm up to 20 years and < 1 cm after 20 years. No solid tissue component was seen in the thymus in patients older than 54 years. A small percentage ~ 5% may contain faint curvilinear or amorphous calcification. Thymomas are closely related to the superior pericardium anterior to the aorta, although they have been described anywhere from the lower neck to the cardiophrenic border. Usually well deﬁned, round or lobulated, homogenous density and enhances after contrast injection. May be heterogeneous if large enough due to areas of necrosis or cystic degeneration. Intravenous contrast is not needed for identiﬁcation of the thymic mass, its role is important with locally invasive tumours for operative planning. The majority of Myasthenia Gravis patients who undergo treatment become completely free of symptoms, and can lead normal (or near normal) lives.